Why choose a glass whiteboard over a standard whiteboard? Choosing a whiteboard should be a very easy task. All you really need to know is what size to select. Well, that’s how it used to be. Now you might be asked what sort of whiteboard you want! That’s because Glass whiteboards are becoming increasingly popular, and it’s no wonder. Why should you choose a glass whiteboard over the standard design? Well, to start with, let’s look at the design and style of a whiteboard. They fit into a classroom, but in the age of modern technology, they look a little bit dated. A bulky frame and a generally out-of-place look means they shouldn’t be brought into a modern office. If you want to give your company a cool but professional look, a big whiteboard ruins everything. This is where glass whiteboards come in. The unique design fits within the modern office environment perfectly. A common problem with a standard whiteboard is the staining that’s left behind after wiping off any drawings or writing. You can usually see a shadow of anything previously wiped off, and without a some cleaning spray, it’s difficult to get back to the clear white you started with. Glass whiteboards however, have been designed to be resistant to this, and they don’t discolour as easy. Many important things are considered when creating a glass whiteboard. For example, you don’t have to worry about damaging it by leaning on it to write. The boards are built with a steel back-plate, which provides support to the toughened glass. Having this back frame also creates a shadow line around the board, giving it an even nicer look, well-suited to a modern work place. As glass is usually… well, see through, you might be wondering how it can be called a whiteboard. Well, the glass is painted white at the back – although it doesn’t have to be white! Companies looking for a bespoke design could pick their own colour, to match their branding or colour scheme. 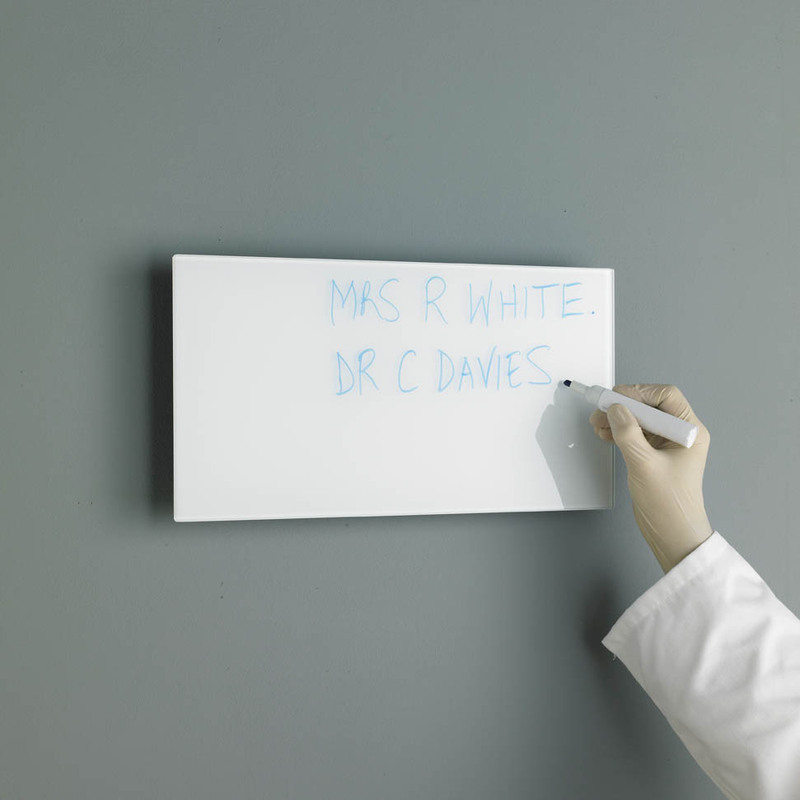 For places like hospitals, who use whiteboards with a table template, which can be used as a timetable, or a grid of patients and doctors, it’s no problem using a glass whiteboard. Permanent marker can be used on the glass, and if a change is needed, it’s easily cleanable. While on the subject of hospitals, some companies such as Glasslab.co.uk create antibacterial boards, claiming that the “antimicrobial action of the glass eliminates 99.9% of all bacteria that form on its surface”. They also prevent the spread of fungi meaning glass whiteboards could be a big advantage to the medical industry. One thing that may seem like an advantage to standard whiteboards is the fact they are magnetic. As well as writing on them, you can stick a note or picture up using magnets – surely this can’t be the case with glass whiteboards? SInce when has glass been magnetic? As we mentioned earlier, glass whiteboards are supported by a steel back-plate, fused onto the toughened glass. Although it won’t be as strongly magnetic as a common whiteboard, due to the glass in between the magnet and metal, things can still be stuck up with the use of hi-power magnets. Some pen trays are also available, to magnetically attach to the plate at the bottom of the board, allowing you to keep your eraser and pens neat and tidy in a convenient place. Overall, in a world where things are constantly upgraded, it seemed like whiteboards could only stay the same. Of course, they’ve been replaced by Smart Boards in schools, but in general it’s hard to go a step up on a normal, non-technological whiteboard. It’s a simple thing you write and draw on, so how could you make it look better, and more suitable and stylish for modern business. Well, the glass whiteboard does just that – it’s the perfect addition to any office. Both practical and good looking at the same time.